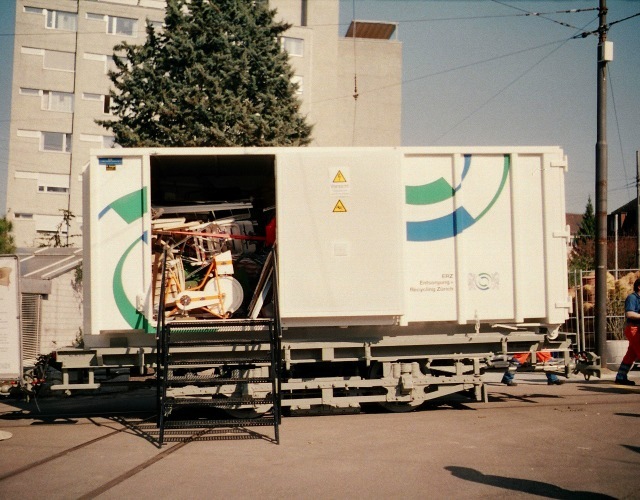 Cargotram at Wollishofen on it's first day in service (15th April 2003). This view of trailer 1984 clearly shows its Peckham truck. This truck is now serving it's third purpose. In contrast to the later Peckham trucks which were built under licence in Switzerland, the original batch were imported from the USA. These were used for cars 57 - 84. These cars originally had open balconies which were later glazed. Their low power and limited capacity led to their conversion to trailers 473-500 between 1926 and 1929. New lighter trucks were constructed for these trailers and the original trucks were reutilised for works cars of various types and descriptions. A small number of these survive today, among them crane car 1952. Trailers 1984 and 1987 survived as permanent way wagons but saw little use during their final years. Their next rebuild was in 2003 when they were prepared to carry standard refuse containers.